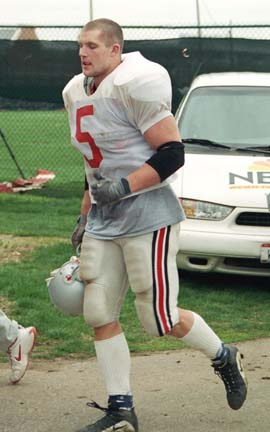 Senior Craig Krenzel is obviously locked in as the very solid starter. Senior Scott McMullen will be his backup, and in the rare times he has seen the field he actually has better passing numbers than Krenzel. It would be nice to see some mop up work for redshirt freshmen Justin Zwick and Troy Smith so that they have some idea of what they are getting into next year. 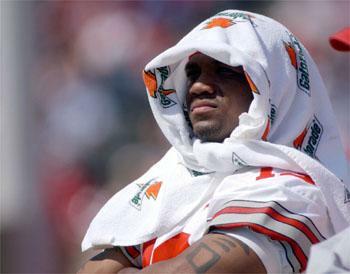 If sophomore Maurice Clarett is healthy, he will be a serious Heisman candidate. If not, the Bucks still have juniors Lydell Ross and Maurice Hall, each of whom could start for many other teams. With the transfer of JaJa Riley, depth is now an issue, but walkon Roshawn Parker has potential and true freshman Ira Guilford could move in from safety in an emergency. Junior Branden Joe and sophmore Brandon Schnittker should each see time at fullback, which has a dimished role in Coach Tressel's multiple offense compared to Coach Cooper's I dominant offense. Personally, I'd like to see a return to the days of the I(not that Coach Tressel doesn't use the I, but it is used more sparingly. On the plus side, he reintroduced the T in short yardage situations! ), and a dominant fullback. Maybe the reason why Coach does not use that scheme is because there is no Matt Keller or Jamar Martin here. Senior SE Michael Jenkins is a huge play threat as evidenced against Purdue and Illinois and is one of the top recievers in the country with his impressive combo of size and speed. Over at flanker, Chris Gamble might see the field occasionally, but I just don't see him as a true two-way starter again. Drew Carter has the body for SE, but he is a senior and needs to see the field and may do so at flanker, but junior Bam Childress and redshirt freshamn Santonio Holmes will also be in the mix for PT. Depth at WR is filled by juniors John Hollins and Angelo Chattams and redshirt freshman Roy Hall. True freshman Tony Gonzales and Devon Jordan should be redshirted. At TE, senior Ben Hartsock is a good blocker and solid reciever. Sophomore Ryan Hamby is probably a better reciever, but not blocker. Sophomore Redgie Arden's status is not clear, but he is a possible depth player. Redshirt freshman Stan White is another possibility, and freshman Louis Irrizary, a great reciever, will probably see the field. Maybe freshman Marcel Frost will also get a shot. Seniors all across and it should be a good one. Alex Stepanovich at center, Bryce Bishop and Adrien Clarke at guard, and Ivan Douglas and Shane Olivea at tackle. The primary depth will come from sophomores Rob Sims and Nick Mangold who will probably rotate in a lot and be definite starters in 04. Other backups include Mike Kne, Jason Caldwell, RJ Coleman, Andre Tyree, Adam Olds, Ryan Cook, Doug Datish, and TJ Downing. I would expect Kirk Barton to be redshirted, but you never know. This could be a dominant unit. Senior Will Smith at DE has not had overwhelming college success but is considered a top NFL prospect. Senior Darrion Scott started at DE last year but will probably move inside this year ala Kenny Peterson. Senior Tim Anderson will join him at DT with junior Simon Fraser starting at the other end. Other DE help will come from Mike Kudla, Joel Penton, and Jay Richardson. The latter two could also help at DT. Marcus Green and Quinn Pitcock should be valuable reserves at DT, and freshman David Patterson could get a shot as well. Losing Matt Wilhelm will hurt, but the Bucks should be fine with the sophomore trio of AJ Hawk, Mike D'Andrea, and Bobby Carpenter chipping in. D'Andrea or senior Fred Pagac will start in the middle, but IMO D'Andrea will have the job by mid-season regardless of who starts agianst Washington. Senior Robert Reynolds could play MLB, but will probably return on the strong side. That will allow AJ Hawk to play weak side where he acquited himself nicely last year. Carpenter, senior Pat O'Neill, possibly sophomore Stan White, and senior Jason Bond are the key reserves. Juniors Chris Gamble and Dustin Fox return at CB. There was talk that Fox might move to safety, but no action from the coaches in that direction at all. At safety, senior Will Allen should step in at the weak spot, with sophmores Tyler Everett and Nate Salley the best candidates at SS. CB depth comes from sophmore EJ Underwood, senior Harlan Jacobs, potentially senior Rich McNutt although his career is likely over from a chronic ankle condition, and potentially freshman Ashton Youboty and Donte Whitner. Whitner could emerge as a starter; he is considered a future shutdown CB. Safety depth comes from sophmore LeAndre Boone, senior Thomas Matthews, redshirt freshman Brandon Mitchell, and true freshman Ira Guilford and Curt Lukens. Junior Mike Nugent is among the nation's top kickers. Senior punter BJ Sander has to step up and replace Andy Groom; he has never been very succesful in his previous trials. Junior Josh Huston will back up both kicking positions. Chris Gamble should return punts, although Santonio Holmes could also see duty and win the job if they want to save Gamble for his other jobs. Maurice Hall will be the primary kick returner. The Buckeyes are national champions for a reason: they have loads of talent and great coaching. There is no reason why Ohio State cannot contend for another title this year. The Bucks were said to have gotten lucky by many last year, but their projected record from their points was 12.5-1.5. You could make the case that if the 5 missing defensive starters(Doss, Nickey, Wilhelm, Grant, Peterson) and Groom are replaced even to say 75% of their performance, that this team should improve. Nothing is ever for sure, many things could go wrong, but the Bucks are a legitamite top 5 powerhouse.